Montana Department of Livestock (DOL) stock inspector Jeff "Bowers" asked Ed for permission to haze the buffalo, and Ed refused. DOL stock inspector Bridger Cunningham assumed authority and trespassed on Ed's property anyway, against Ed's wishes and the Governor's directive. The landowners stood up for their rights, and those of the buffalo, with very vocal opposition to this illegal trespass. On Monday, BFC got a call from a property owner living off of Denny Creek Road, near the South Fork of the Madison River, a favorite place for wild buffalo. 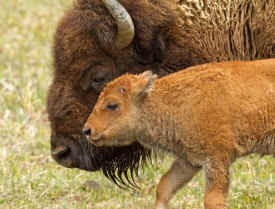 The landowner, Ed Ryberg, called to say there were about thirty cow-calf pairs of buffalo on his property and he didn't want the Department of Livestock (DOL) to haze them off. Ed and his wife are very buffalo friendly. My patrol partner Ben and I went out to Ed's place. After introducing ourselves, we gave Ed a copy of Governor Bullock's directive (LINK) stating that the DOL is not allowed on private property to haze buffalo without the landowner's permission, unless there is an "imminent threat" of brucellosis transmission to livestock. There was no "imminent threat" as the closest cow was more than two miles away, with numerous properties and fence-lines between them. Nevertheless, two DOL agents and one Montana Fish, Wildlife & Parks (FWP) agent soon arrived at Ed's place. Montana Department of Livestock (DOL) stock inspector Jeff "Bowers" asked Ed for permission to haze the buffalo, and Ed refused. DOL stock inspector Bridger Cunningham assumed authority and trespassed on Ed's property anyway, against Ed's wishes and the Governor's directive. The other two agents waited on the edge of the property. Ed Ryberg showed Bridger the letter from Governor Bullock, but Bridger completely ignored him and attempted to haze the buffalo. The buffalo had other ideas and would not move. The landowners stood up for their rights, and those of the buffalo, with very vocal opposition to this illegal trespass. While Bridger was attempting to haze, he was bluff charged numerous times by a bull buffalo. After about the fourth bluff charge, Bridger finally realized that the buffalo weren't going to go along with this government harassment. Finally, Bridger left -- without the buffalo. The DOL canceled operations for the day and the buffalo stayed where they were. Bridger never showed Ed any proof of his supposed right to trespass. BFC would like to give thanks to the Rybergs for standing up to bullies, and for fighting for their rights and the rights of the buffalo!